Husb and I have an allotment and we went to the site’s annual general meeting last night and I was really surprised to see two other scribblers there. 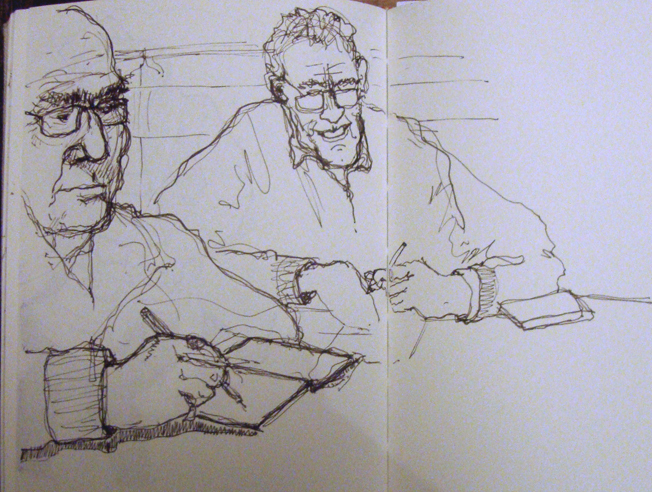 So I pulled out my sketchbook and scribbled them scribbling others. We have been growing lots of fruit on our plot, but the soil is heavy clay and we have struggled to grow veg. We’ve been building raised beds but they need a lot of filling, which is why we’re often going off to farmyards and stables, shovelling up sacks of manure to enrich our soil. It’s really hard work and I appreciate farmers much more since we’ve had it. Our plot is behind Oystermouth Castle, built in the twelfth century. We are so used to castles littering our landscape (Swansea has two) that we take them for granted, but they’re quite spectacular really and Oystermouth is a particularly lovely one. Swansea City Council has done a lot of renovations in recent years, including an art gallery and it gets a lot of visitors. At this time of year, when there are no leaves on the trees, the castle is visible from the plot and it’s a great place to spend a few hours. If the Oystermouth link is anything to go by it looks like the view from your plot is quite inspiring!